I will explain, but first, a bit about the man himself. Christy is an artist, author and traveler. He has exhibited his art internationally. He has written more than 20 books. His travels have taken him from the Yukon to the Amazon. He was raised in Philadelphia, but moved to Toronto when he was 23 years old. Becoming a Canadian citizen, he currently resides in the township of Stirling-Rawdon, Ontario. 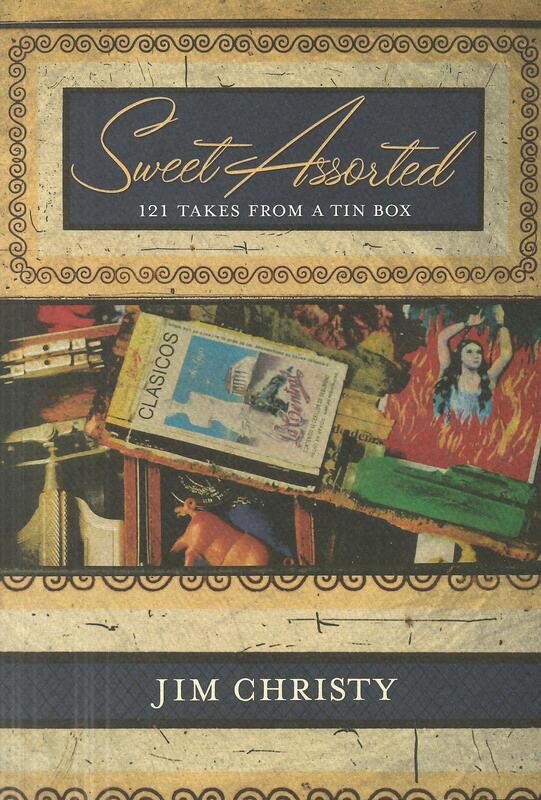 His gem-of-a-book, Sweet Assorted: 121 Takes From a Tin Box, was published by Vancouver’s Anvil Press in 2012. “For nearly 40 years,” Christy writes, “I’ve had this metal Peek Frean’s box into which I’ve tossed items randomly, willy-nilly and with neither rhyme nor reason…. “Going through the box, taking inventory, has meant one discovery after another…. There’s one from St. Augustine Alligator and Ostrich Farm. A third is a colour picture of a decorated van. Yet another is from Ravenna, Italy. I’m intrigued by the photographs. There’s one of Bar El Galeon at El Progreso, Yucatan, Mexico. There’s another from Buenos Aires, and two from Saigon. Yet another is a studio photograph of Joseph Isaac “Ike” Clanton, taken at Tombstone, Arizona, in 1880, the year before he and his brother Billy were gunned down by the Earps and their dentist pal, Doc Halliday. Coins caught my attention. There’s a Kennedy half-dollar, as well as a 50-cent piece from the Kingdom of Swaziland, and a bright Cuban peso coin. I wonder how many of us have our own “tin box.” Well, it may not be an actual box; it might be something as simple as a file folder. I have one with the heading of “Keepsakes.” It’s bulging with this, that and something else. While writing this article, I dipped into it, to see what I had collected over the last three decades. There’s a booklet, The Adventures of Pac-Man which, according to an inscription on the cover page, belongs to my son, Christopher. There’s a depiction of a boat, Hayley, Caleb & Hannah, drawn in church by one of the siblings and passed along to me. There’s a postcard from one of the young people in my youth group who had relocated to British Columbia. The front is a drawing of a bald man, along with the words, “Bald is beautiful. God only made so many perfect heads. The others he covered with hair!” Touche. There’s a letter I wrote in 1980 to my dearly beloved, Sherry, with this probing question, “By the way, what are we going to do on the night before we’re married?” I’m not going there. There’s a postcard with this inscription on the reverse, “Hi, there. From Sally Field.” Sally Field? Wherever did I get that? There’s a Merchant’s Coupon Book, produced in the first decade of the last century. I bought it at some auction, but I don’t recall which one. There’s an Autumn 1946 booklist from SCM Press. There’s a booklet about Gillett’s Cream Tartar from E. W. Gillett Company Ltd.
There’s a sawmill return, produced by the Commission of Government’s Department of Natural Resources, St. John’s, in 1943. There’s an announcement of the 1939 Royal Visit to Newfoundland. And, there’s a Darren Langdon hockey card I picked up for my son. On and on it goes and, admittedly, I wonder today why I kept some of this stuff which, at the time, obviously meant something to me. In short, there’s something for every taste in my Keepsakes file, as well as in Christy’s book.